Hello guys! In today's post I'd like to introduce you to Lens Circle, an online store that sells circle lenses. 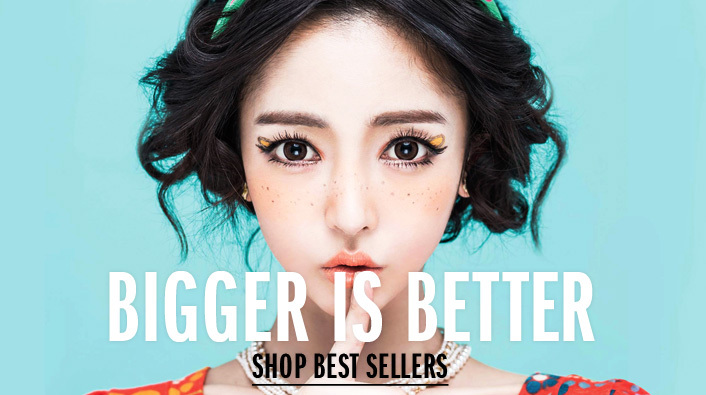 Circle lenses are the new fashion trend in Japan, Korea and Taiwan to make ones eyes appear larger. People do not only want to change the color of their eyes, but they want to be noticed. One way they do this is by wearing circle lenses. There is currently no other way to make a person's eye appear larger other than wearing circle contact lenses. But, what is the difference between normal lenses and circle ones? The main difference between circle lenses and normal color contact lenses is circle lenses will make the eye appear larger. The size is around the same (14.0mm), however, because circle lenses not only cover the iris of the eye, but also the outer extra-wide rim of the lens, it makes the iris of the eye appear larger. With normal color lenses, this tinted area is transparent (no color tint), thereby, only allows the tint to cover the iris of the eye.